We occasionally come across a piece of equipment which raises eyebrows at first glance, the Mudderboot is one such product! 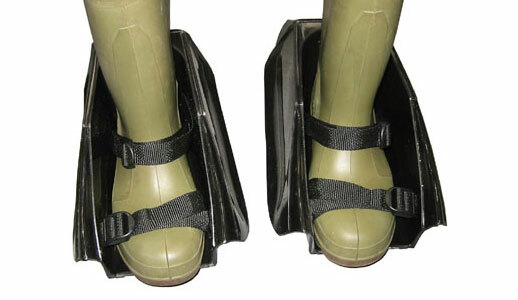 Designed to be used on soft ground where there is a risk of someone sinking, the Mudder boot or mudders ‘wings’ spread out when the user stands on soft mud or sand keeping the person on the surface. These wings contract when on hard surfaces allowing the wearer to walk relatively normally. The following video of the Mudders gives an indication of how useful they are. Compare the person who starts at the side of the boat wearing Mudders to the person making their way from the jetty side on the left! Getting stuck in soft mud can be incredibly dangerous but there is help at hand… Abaris International offer the bizzare looking Mudderboots or ‘Mudders’ which are proving very popular with rescue teams, marine scientific research organisations, cockle-pickers and bate diggers. These odd looking contraptions are simple in design, the ‘wings’ spread out when the foot presses them down onto mud or sand, allowing the wearer to walk across what would normally be treacherous surfaces. One-size-fits-all they fit to the bottom of pretty much all types of footwear.